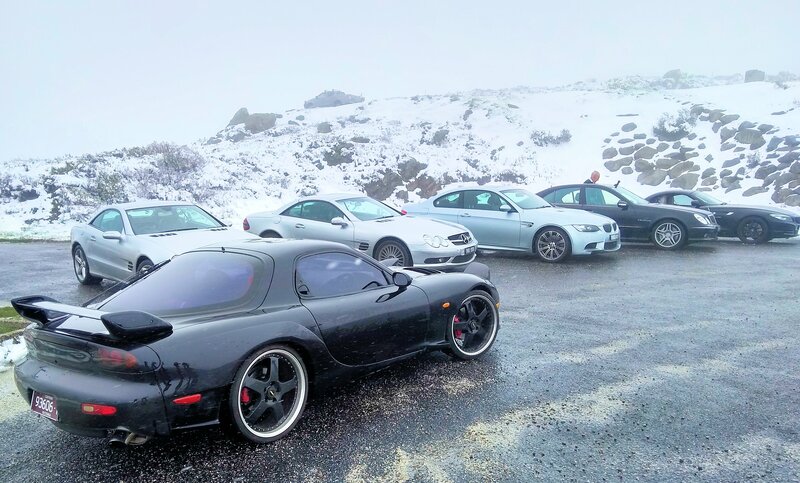 It happens occasionally that club members organise non-official events amongst themselves; and so it was that during this week, five members and a hanger-on set off on a three-day romp up and over Victoria’s high country. Five German heavy hitters and Ian Holdsworth’s wide-bodied, turbo Mazda RX7 headed north from Warragul on Wednesday in fine conditions and enjoyed a fairly traffic-free run to Yarra Junction, but it wasn’t to last with slow traffic and roadworks spoiling the run out through Healesville and through the Kinglake National Park. Lunch at the Flowerdale Pub eased the pain, and the afternoon drive along seldom-used secondary roads that took us eventually to Euroa, Merton and Mansfield were thoroughly enjoyable. Kevin Riley had booked us accommodation at the Alzburg Resort in Mansfield which is an old Catholic Convent and Girls School that now boasts a swimming pool, sauna, tennis courts and a selection of single and family room arrangements. The cars were refuelled prior to dinner at the Delatite Hotel, and it wasn’t surprising to see Steve Schmidt’s 3-litre, twin-turbo BMW Z4 the most frugal of the pack with 9.4 L/100km. The four V8s were all around 11 or 12, with the powerful, but thirsty rotary requiring twice as many fill-ups and a wary eye on the fuel gauge. Day Two, the cars were given a chamois down in the car park after heavy overnight rain, then it was off to breakfast in preparation for a dash over some terrific roads to Whitfield, Murtleford and Bright, then over the Tawonga Gap to Mount Beauty before a short pause and refuel for the Mazda prior to the climb up to Falls Creek and the Bogong High Plains Road. The rain was intensifying and temperature dropping as we climbed towards the ski resort. Snow began appearing by the roadside and before we knew it, flurries of snow began falling and the scenery tuned monochrome. In foggy, snowy conditions we headed on past the Alpine Village and stopped for a photo opportunity at the Rocky Valley Dam, although we couldn’t actually see it through the fog! We pressed on towards Anglers Rest, but the road was disappearing under the snow and we only had the wheel tracks from earlier vehicles to follow. Eventually the snow became too deep and Kevin’s SL55 AMG found itself stuck on the centre strip of snow between the wheel tracks. It was below zero, the icy-snow was being blasted by strong winds, the Merc was stuck fast and it was obvious we weren’t going any further in this direction. Luckily a group of people in several four-wheel-drives coming the other way assisted in towing the Merc out of trouble – they really didn’t have a choice though as we were completely blocking the road. Eventually we turned all the cars around and headed back to Falls Creek to look at our options. We decided to regroup at Mount Beauty so that the Mazda could refuel again, the rest of us also took on fuel, coffee and warm food. Ray Youlden had rung around and discovered that despite the snow and higher elevation, the road over Mt Hotham was open and kept clear thanks to the use of a snow plough. So it was back over the Tawonga Gap towards Bright, then up and over Hotham in similar conditions to that experienced at Falls Creek, minus the 10” of snow all over the road. The snow stayed with us, however, right through Dinner Plain, but as we dropped down from the high plains the weather improved allowing us to enjoy the drive again. Steve and Glenn Campbell swapped BMWs for the diversion through Cassilis and along the Swifts Creek Road. Both cars being handed back unharmed after what could only be described as a fairly intensive road test. Despite covering well over 100km beyond our planed route, we arrived at our lodgings in Metung at around 6pm and after settling in, headed straight to the pub for a well-earned meal. The final day saw Ian, Glenn and Rob Morley heading home directly along the Princes Highway through Bairnsdale and Sale, whilst Kevin, Steve and Ray enjoyed a more circuitous route through Glenaladale, Briagolong, Heyfield, Glengarry and Yallourn North. We’d covered over 1200km in three days in extraordinary conditions and the cars, although now filthy, performed faultlessly. Thank you to Kevin for bringing it all together, leading the pack and keeping us on the right path – most of the time ! Who said Mature Gentlemen don’t know how to have fun like Testosterone filled Teenagers! Well done boys … you survived the Alpine challenge … & with no infringements I gather! Better than staying down here in this miserable sleeting, cold wind & rain. Wot? No roofs off? Pack of wimps.